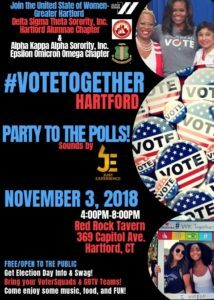 Join the United State of Women-Greater Hartford, Delta Sigma Theta Sorority, Inc. Hartford Alumnae Chapter, and Alpha Kappa Alpha Sorority, Inc., Epsilon Omicron Omega Chapter in a #VoteTogether party for the Greater Hartford Community. #VoteTogether is a national campaign and its mission is to build up excitement for civic engagement. The USOW-GH received a grant from #VoteTogether to host a party for our community….so let’s party to the polls. This Saturday, November 3rd from 4pm-8pm at Red Rock Tavern, we hope you come out and support! Come grab some voting swag, buttons, signs, make a voting plan, and get Election Day reminders. This is NOT about partisan politics, this is about good music, good food, and FUN! There will be games and prizes! We hope to see you there! Hope you are ready for November 6th!!!! Copyright © 2019 Alpha Kappa Alpha Sorority, Inc. Epsilon Omicron Omega Chapter. All Rights Reserved. Alpha Kappa Alpha Sorority, Inc. is not responsible for the design nor content of these web pages. They are the sole property and responsibility of the Epsilon Omicron Omega Chapter who hosts and maintains this website.